Everytime you visit a website, its images and records are stored on your computer as a part of internet history. In Google Chrome, you can easily view and delete history date-wise or complete listing. Manually deleting internet history at start or close browsing session can be boring and time consuming. You can get automated using auto clear history option in Google Chrome. 3. 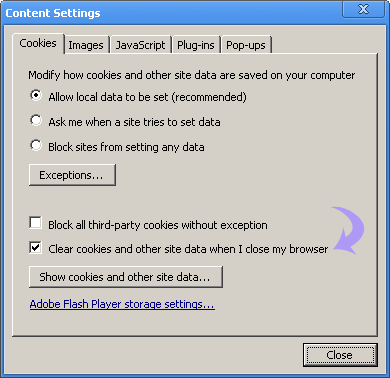 Now click ‘Cookies’ tab & click to select option “Clear cookies & other site data when I close my browser”. 4. Then Click ‘Close’ button. From now on, internet history will be deleted each time you close and launch Chrome again. This funcationality of clearing internet browsing history on closing browser is now available in majority of modern web browser. Checkout auto clear routine setup in Firefox and Internet Explorer. the UNDER THE HOOD tab of my browser doesn’t have CONTENT SETTING tab! this feature DOES NOT actually work. it remembers the sites you have visited unless you go in and manually delete them. This clears cookies, but not history. When I close my browser and re-open it, it still shows all the websites I visited. This doesn’t actually work though. It will clear cookies, but not your history.